There are not many building styles more traditional than the log cabin, so it is always refreshing to see a new idea take advantage of the humble tree trunk. It’s a bonus when the design boasts efficient prefab construction and contemporary finishes. Commissioned by the entertainer Hans Liberg and designed by Piet Hein Eek, this music studio has a hide-and-seek exterior and bright work-all-day interior. Set on wheels, the studio shares its transportable potential with a certain Mobile Tree House, but aesthetically it is very much aligned with OLGGA’s Portable Log Cabin. 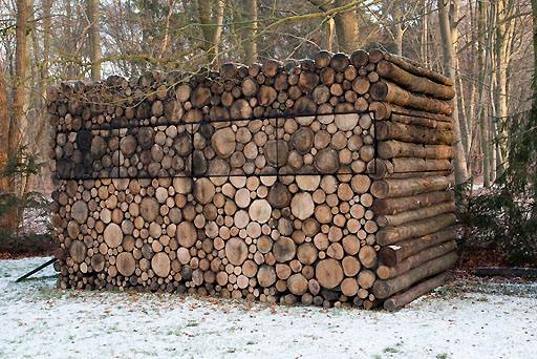 The rough-hewn exterior artfully creates the sense that the structure is a simple stack of log rounds. 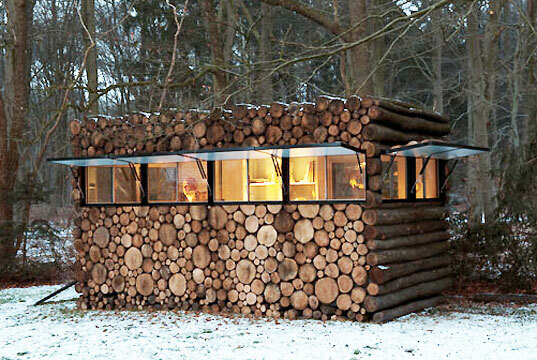 The window coverings even have a painstakingly placed log façade to complete the illusion. The structural element is a salvaged steel frame and the walls are painted plywood. The Log Studio kindles a creative spark and reminds us how beautiful small-space living can be. At first glance it looks like it's made out of solid wood. It's a nice idea and it looks great.